For the second year running, Blossom Seeds will be distributing goodie bags to needy elderly. Sponsor a goodie bag today and spark up the Spirit of Giving! Blossom Seeds and Blossom World Society have been organising Blossom Love for the third year to raise funds for both charities’ operating expenses. Every dollar raised from the lunch helps create a community of compassion and harmony between the young and the old, of various racial and religious backgrounds. Thank you for accompanying Blossom Seeds on this journey to reach out to the elderly. Year end is a time for reflections and appreciation. Join us in this celebration to meet your fellow kakis. 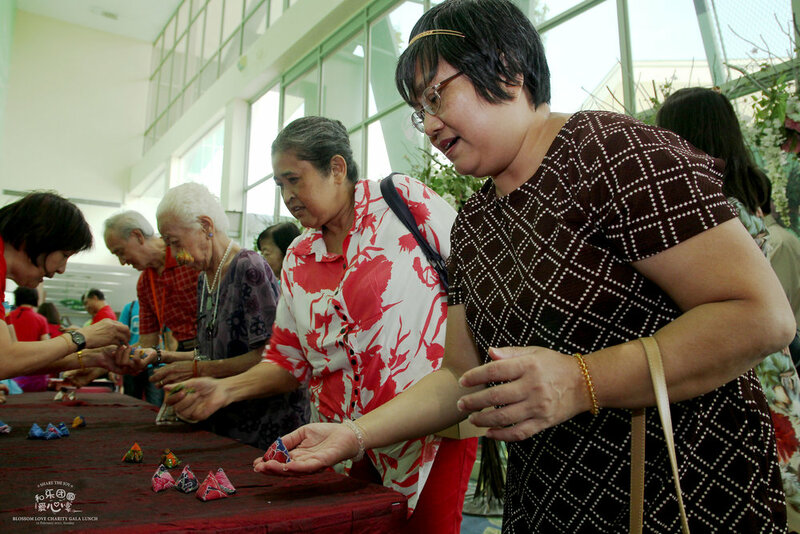 Do a good deed and brighten up the day of a needy elderly during this coming Mid-Autumn Festival. For only a donation sum of $20, Blossom Seeds will deliver a mooncake on your behalf to one needy elderly. Urge your friends to join in this good cause too as we aim to bring more cheer and joy for the needy amidst the festivities. They are only required to contribute $20 each and Blossom Seeds will take care of the mooncake delivery to the elderly. Alternatively, they can choose to just donate any amount to Blossom Seeds directly. All donations will go to funding Blossom Seeds activities that promote and support the well-being of the needy elderly. Note: please indicate your name, contact number and address and "Sponsor a Mooncake, Delight a Needy Elderly" behind the cheque. To make a bank transfer, you may do through Internet Banking or at UOB ATMs. The followings are the details. SMS or whatsapp us at 98156389 with your name, address, amount donated and "Sponsor a Mooncake, Delight a Needy Elderly"
All net proceeds will be contributed to Blossom Seeds Limited for activities that promote the well-being of the needy elderly. Get up! And get moving with your family at our FAMILY Carnival 2017. The FAMILY Carnival 2017 encourages families to set aside this day to spend time together and to promote family bonding. Jointly organized by Blossom World Society and Blossom Seeds Limited (both charities with IPC status). The carnival promises a massive fun filled event of activities like ring toss, tic-tac-toe, three-legged race, Escape Room and many more! Be prepared to be entertained by carnival games, heartwarming family activities and lively stage performances, and don’t miss out on the chance to win stage game prizes, worth $600 in all. There will also be free gifts given out to 1,000 Pioneer Generation (PG)card holders (whilst stocks last). Also, Guest of Honour Ms Sim Ann, Senior Minister of State, Ministry of Culture, Community and Youth & Ministry of Trade and Industry will be there to grace the event. Carnival coupons are selling at $10 each, you can use the coupons for food, bazaar items and Escape Room. Otherwise, ADMISSION IS FREE! So what are you waiting for? Spread this news to your family and friends now! - Carnival games : ring-toss, tic-tac-toe, shooting gallery, bean bag toss. This is a joint event by Blossom World Society (BWS) and Blossom Seeds Ltd (BSL).Net proceeds will go to both organisations equally.